CS Unitec American Type Pipe Wrenches are a part of CS Unitecs Non-Sparking / Non-Magnetic Safety Tool Line. 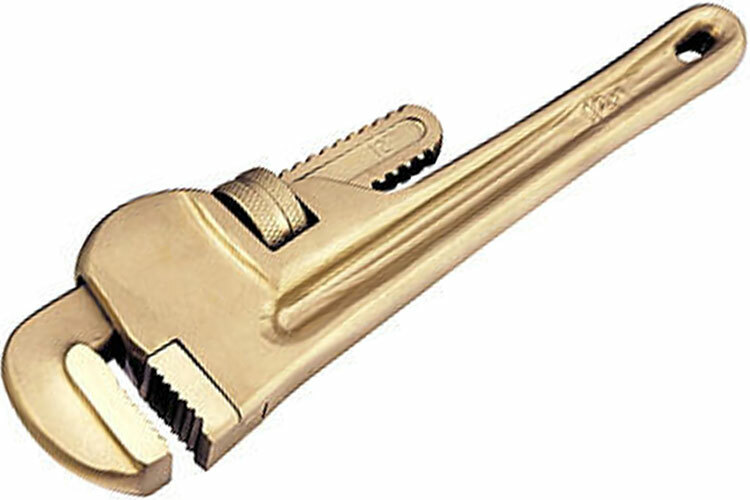 CS Unitec American Type Pipe Wrenches are available in Aluminum Bronze or Copper Beryllium. EX1101BH-20B CS Unitec Banana Wedge with Lanyard Hole. Type: Copper Beryllium Width: 3/4'' Length: 12'' Weight: 1.6lbs. EX1101U-1A CS Unitec Flange Wedge with Lanyard Hole. Type: Aluminum Bronze Height: 1/4'' Width: 1/2'' Length: 3'' Weight: 0.04lbs. EX1101U-1B CS Unitec Flange Wedge with Lanyard Hole. Type: Copper Beryllium Height: 1/4'' Width: 1/2'' Length: 3'' Weight: 0.04lbs. The EX502-18B CS Unitec American Type Pipe Wrench, Copper Beryllium is one of thousands of quality tooling products available from MRO Tools. Please browse CS Unitec Most Popular Non-Sparking/Non-Magnetic Safety Tools for tools similar to the EX502-18B CS Unitec American Type Pipe Wrench, Copper Beryllium. EX502-18B CS Unitec American Type Pipe Wrench, Copper Beryllium description summary: EX502-18B CS Unitec American Type Pipe Wrench. Type: Copper Beryllium Jaw Capacity: 2 3/8'' / 60mm Length: 18'' / 450mm Weight: 6.28lbs. / 2.85kg Quantity discounts may be available for the EX502-18B CS Unitec American Type Pipe Wrench, Copper Beryllium. Please contact MRO Tools for details.